This show has became one of the biggest hits among young people in recent years. Every series has been brilliantly funny, and with the first episode of the third series hitting 3million watchers its popularity continues to grow! And you can now get more of Jay, Simon, Will and Neil via an iPhone application. It costs 59p and is available to buy now in the App Store. I’m a big fan of the show, and this app gets some decent reviews,unfortunately in my opinion this app is very disappointing and I expected a lot more. 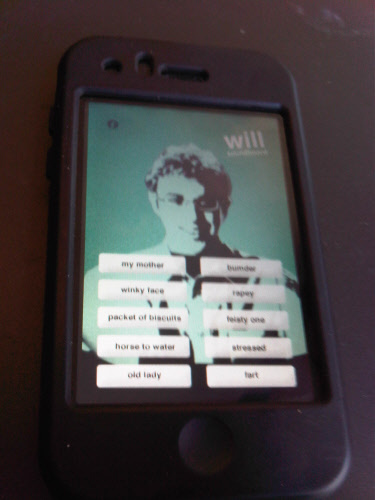 Once the Inbetweeners iPhone app is fired up we are presented with Will. Touch the screen and a random phrase will play. Pressing the info button brings up a menu where you can choose what he is going to say. By swiping the screen you will move to a different character, and their phrases from the show will then be played. If you press the name of the character they do a kind of jig and press another and a little ad informs you of the DVD release out soon. Though I get the fact that this a fad app, and it says in the description it is a soundboard, still only having a few catchphrases is quite poor. It soon wears thin. It could be so much better; why not have a few of the funnier moments from the programme or a trivia quiz about the show, or quotes never said during episodes, or deleted scenes, or something like that. It is a big shame. This appears to just be a platform to advertise their DVD, rather then enhancing the program. Stick to watching the TV series if you love the show like me. For such a great show I would expect this to offer a lot more. It will also cost you £0.59, yes its only pennies, but even if it was free you probably wouldn’t keep it on your phone for too long. For a top TV program this is a poor app to support it. Disappointed.